From 24-26 September a group of 21 companies (of which 16 IRO members) joined the Oil & Gas Trade Mission to Mexico that was organised by the Embassy of The Netherlands in Mexico in collaboration with the Ministry of Energy of Mexico (SENER), the Dutch Energy Association (DEA) and IRO. The opening of the Mexican oil and gas industry has placed the country in the international spotlight. The Energy Reform in Mexico has been very successful, professional, fast and above all transparent until now. For the Oil & Gas sector, the reforms resulted in 107 new contracts with 73 companies from 20 countries with a total estimated investment of US$161 billion. By winning nine offshore deep-sea blocks, Shell became the biggest private player in the Mexican market. The opening of the Mexican market brings new opportunities for the offshore industry. However, the way of doing business has changed. PEMEX, whose monopolist position ended after more than 70 years, is facing international competition and must comply with the high standards these companies are introducing. Many local suppliers also need to change in order to adapt and comply with these international standards. New expertise and knowledge is welcome and a strong local supply chain will benefit us all. With a new government in place on 1 December of this year, CSR and local content will become more important than ever in our business and investment relations. That means that if you want to profit from this growth market you need to be part of it and find local partners. Working together on these matters with the Mexican government and local industry will give Dutch companies a competitive advantage. These areas also have highest priority on the Dutch foreign trade agenda. During the mission interesting presentations were given by among others PEMEX and the Mexican government (SENER), financial institutions and regulatory bodies. Also a seminar ‘New operators and Dutch success stories’, with presentations by Shell and Damen was part of the program. A networking Golf Day organised by Boskalis and many lunches, dinners and cocktail receptions gave the participants plenty of opportunity to network. 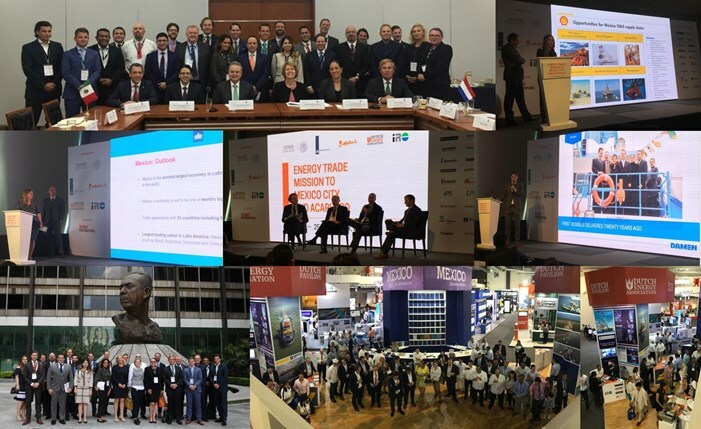 Trade mission participants were also given the opportunity to visit the Mexican Petroleum Congress (CMP) in Acapulco, where the Dutch Energy Association hosted a Dutch Pavilion from 26-29 September 2018. The next edition of the Dutch Pavilion at the Mexican Petroleum Congress (CMP) 2019, will take place from June 19-22 in León, Guanajuato. Presentations given during the mission can be downloaded below.